The first post of this series laid out background considerations about 3 things: what steeks are, what a facing is, and what yarn is best to use. Later posts will show further variations--steeking sleeve openings and color knitting, how to add buttonholes and zippers, etc. But for today, this (LONG!!) post shows the basic method. It is step-by step tutorial for a faced steek. There is no sewing machine or hand-sewing involved. Instead the garment edges are stabilized with a crocheted slip-stitch, then cut, then covered with a previously-prepared knitted facing. The basic version of this steek--the version shown today--is the sort of steek you might put into a striped or one-color sweater. If you choose to try this method on a garment, proceed with the warning that this is a new trick, not yet fully garment-tested. 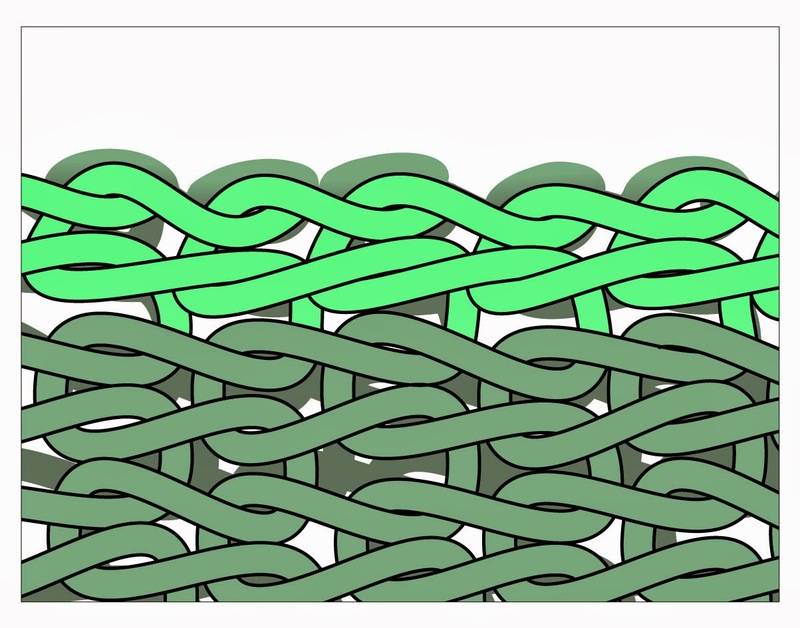 Everything about this trick--from the order of operations to the final result--is driven by this truth: once a piece of knitted fabric is cut, the cut-edge is liable to disintegrate. Although long-fiber and "rustic-type" wools can take a certain amount of handling after cutting, the more common soft and lofty "Germantown-type" wools are more delicate. And with any kind of yarn, over-handling or pulling can turn that cut-edge into a truly terrifying mess of loose ends. 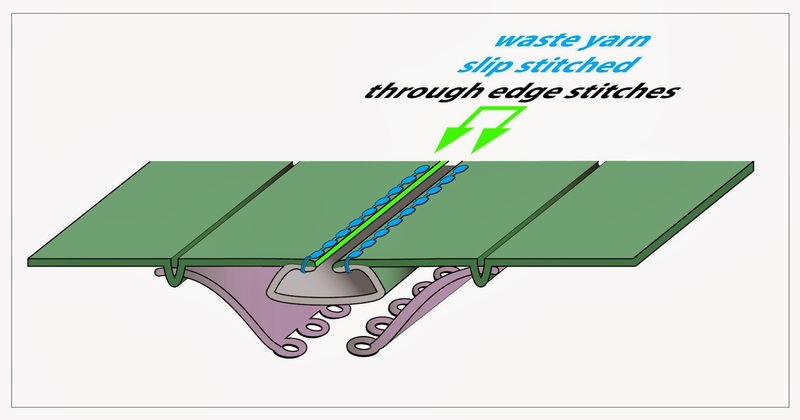 Preventing any chance of a mess means minimizing the amount of time during which the cut-edge is exposed. Therefore, a lot of this method involves steps to set the stage BEFORE doing the cut, followed by steps to quickly seal the cut-edge under the facing AFTERWARD. Once you've run through the entire process, it'll be obvious how the operations fit together. Yet, the preparation steps might be mysterious: confusing on first try. To tame confusion, this post features a lot of color-coding, schematics, diagrams and photos--as stated above, this is a LONG post! 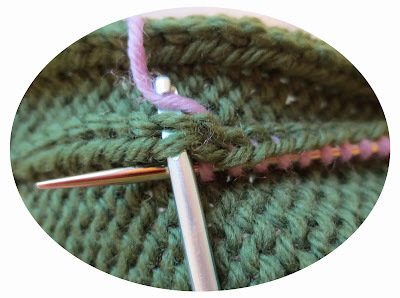 So, if you' are willing, here we go with a step-by-step tutorial for creating a faced steek on a swatch. Contrast color (cc): a quarter ounce of a lighter weight yarn in a contrasting color for the facing. The sample cc is a sport-weight lavender ........ wool of unknown origin. bright-colored waste yarn, a few yards, in a color unlike mc or cc. The sample uses a single strand of blue ........ needlepoint wool. Using crochet hook and smaller knitting needles, locate the purl columns (also color-coded green ........) which act as an anchor for the facing. Use that column to pick up the stitches for one long edge of the facing ........ then knit the facing, but do not bind off. Repeat for the second facing. One last thing before we start: If you click any chart, schematic, diagram or photo, it will become a lot bigger. Rather than make you take the time to knit a tube, this tutorial shows the steek on an ordinary square of flat-knit fabric. Once steeked, this swatch winds up in two separate pieces. I think you can imagine that steeking a tube by the same method would leave the slit tube opened flat into a single rectangle featuring two faced edges. Using the green mc, cast on 22 sts. Row 1: k5, p1, k10, p1, k 5, turn work. Below is a chart for those who prefer one. (If the color coding and column numbering on the chart is distracting, just ignore it: we'll come back to them later.) Below the chart is a schematic of the fabric, showing the concept of the swatch. As seen from the smooth side of the stockinette fabric, columns 6 and 17 are purl columns. From the reverse side, these are knit columns, per photos below. Below are photos which translate the concept into the real world--photos of an actual sample swatch "in the wool," showing front (left photo) and back (right photo). This swatch is around 30 rows high. The green arrows point to the purl columns. As you see, although purl columns are practically invisible from the front, they're quite prominent on the back, where they appear as knit columns on a reverse stockinette (purl fabric) background. The next step is to knit the two facings. 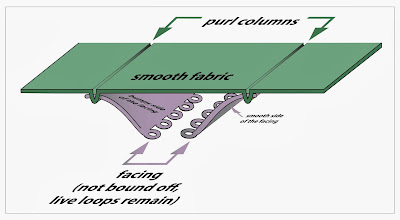 Here is an entire post about how to pick up fabric for a facing through a purl column. I'll wait here while you read that. 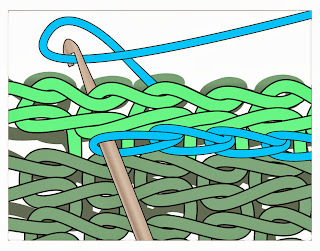 The below photo shows the direction of picking up the stitches for the facing ........ through one of the purl columns ........ (either column 6 or column 17). Note that the swatch has been turned sideways, so that the outer edge of the swatch (either column 1 or 22) is at the top of the photo. Stated otherwise, the stitches for the facing are picked up so that the live loops point towards the center, where the cut will soon be made. The facing is worked on these loops. 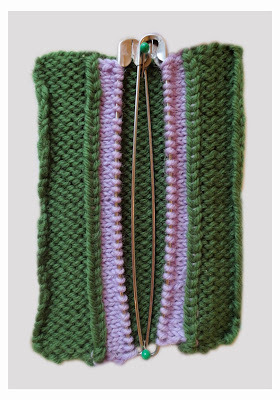 The method of the work is to draw a lavender-colored loop through the purl column with a crochet hook, then immediately transfer it to the waiting smaller knitting needle. 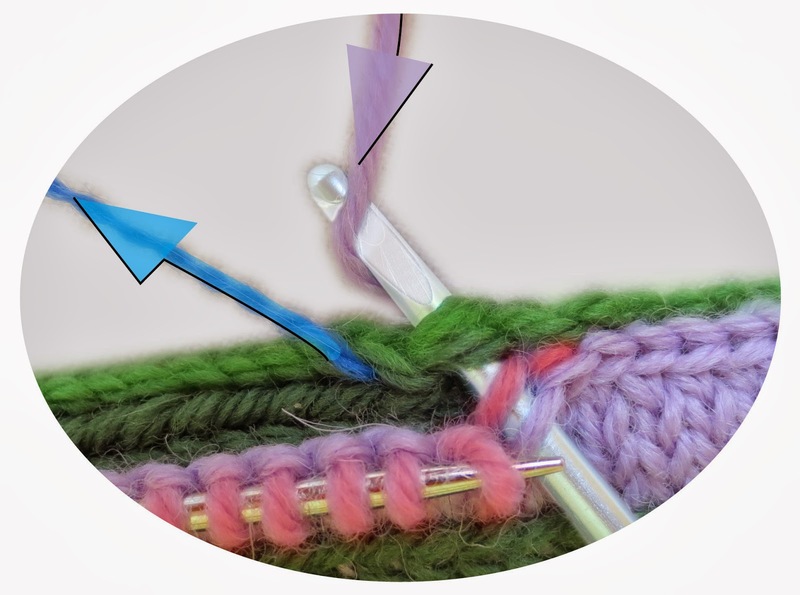 In the below photo, the crochet hook is in the act of grabbing the running yarn to draw a new loop though the purl column, while the previously-drawn through loops are parked on the smaller knitting needle stationed under the purl column. Once you have the anchor loops for the facing drawn through along the entire length of the purl column, work 4 rows of stockinette, then transfer the live loops to a holder. ("Work 4 rows" means four rows of knitting above pick-up loops, with the fourth row remaining on the stitch holder to await further action later.) Repeat the entire pick-up-and-knit procedure on the second purl column. The below schematic conceptualizes what the fabric looks like once both facings have been picked up and knit. Note how the facings are picked up through the purl columns. The below photo translates the conceptualization to reality. In this photo, you can see the smooth stockinette side of each facing against the bumpy reverse stockinette of the swatch. Again, in the schematic, as well as the photo of the sample, the facings point towards the center, and are not bound off. 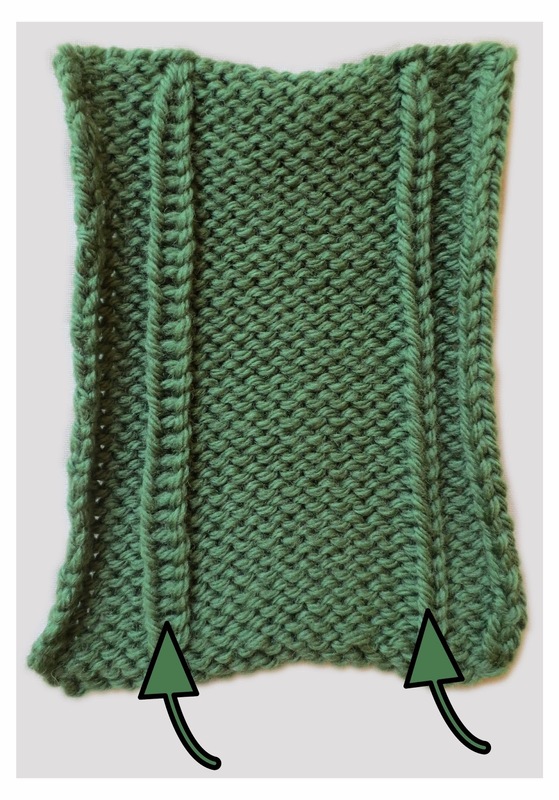 By the bright green color-coding ........, the stitch chart at the beginning of this post shows columns 9 and 14 are going to become the garment edges once the steek is completed. Before we go further, let's figure out why these particular columns will be the garment edges. For simplicity, we'll only look at the right side of the eventual cut, but, of course, the identical situation applies on the left. If you look at the chart, the cut ....... is made in the trough between columns 11 and 12. Counting center-wards from purl column 6 ........ you can see that after the cut, 5 columns of fabric will remain: columns 7, 8, 9, 10 and 11. Column 9 will therefore be the center column of the remaining fabric between the cut and the purl column. There is another factor, too, which works to isolate the cut-edge. You see, Col. 9 runs along the top of a vertical fold. 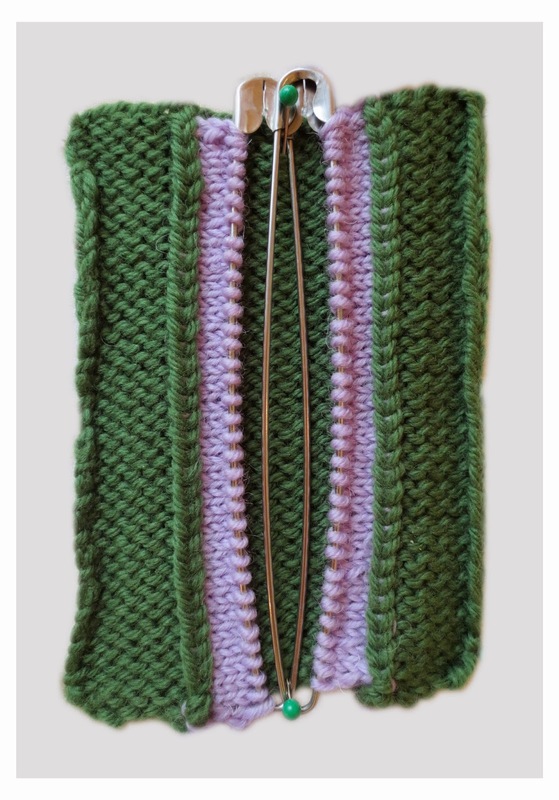 That fold is going to be permanently locked shut via a line of crocheted slip stitch. Result? Even if the cut edge could somehow come undone while sandwiched between the facing and the outer fabric, the resulting loose end of yarn would have to somehow wiggle through a locked-shut 180 degree fold. The fold is the heart of the trick, and here's how it's done. 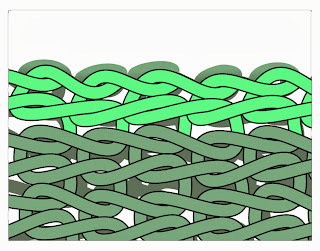 If you fold your swatch vertically, with column 9 (or 14) as a single column of knitting along the edge, it will resemble the bright green ........ single column in the diagram below. 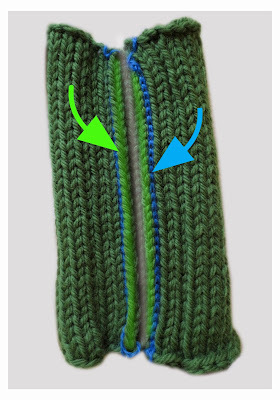 Once you've got the fabric folded at the correct column, you want to slip stitch this fold into place, using the waste yarn, as shown in blue, below. 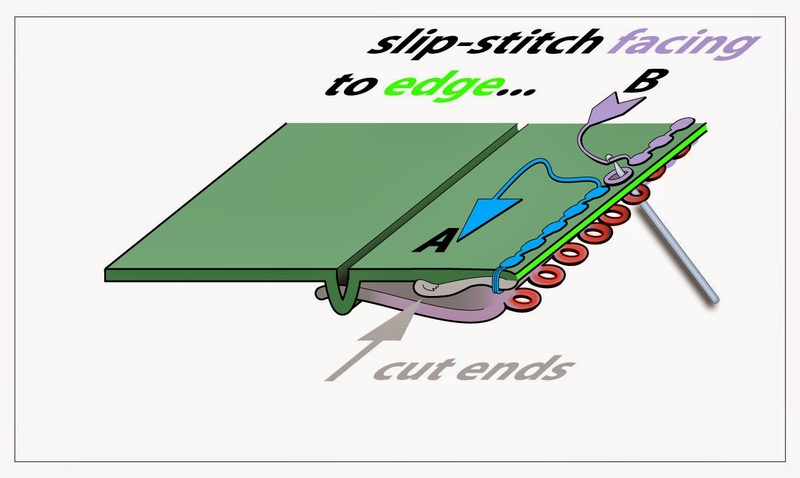 Here is a photo, showing the slip-stitch process in the real world. This slip stitching is temporary, and will be replaced in the grand finale--the last step, right after the cut. The below schematic conceptualizes what the fabric will look like once both folds are locked down with waste yarn ......... Note the edge column of the bright green fold ......... Note also that the loop of fabric caught under/between the two lines of slip stitch is now colored light gray ........ showing that this will become the cut-edges of the fabric. The below photo translates the conceptualization, showing what the actual swatch will look like at the end of this step. The bright green arrow points to the the folded edge ........ which has been colorized to be a brighter green than the surrounding columns. The blue arrow points to the line along which the waste yarn has been slip stitched ......... The fabric to become the cut-edges is visible through the slit, colorized gray. The stage has been set: the facings are knit, live loops a-waiting. The edge has been temporarily stabilized with waste yarn. It's time for the cut ....... (the "eek" part of the steeking process). As stated above, stockinette fabric wants to curl under. Our job in cutting is to preserve the stockinette structure as much as possible, so that the cut edge will curl the heck out of the way, to stay forever trapped in the facing-sandwich. Therefore, the cut is made right up the trough between columns 11 and 12. In other words, don't cut through the stitches in the columns, but rather, carefully separate the columns of stitches by putting the cut right up the middle. Here's the photo: you can see the curl is so strong that it actually follows the scissors: the instant you cut, the cut-edge wants to curl under. 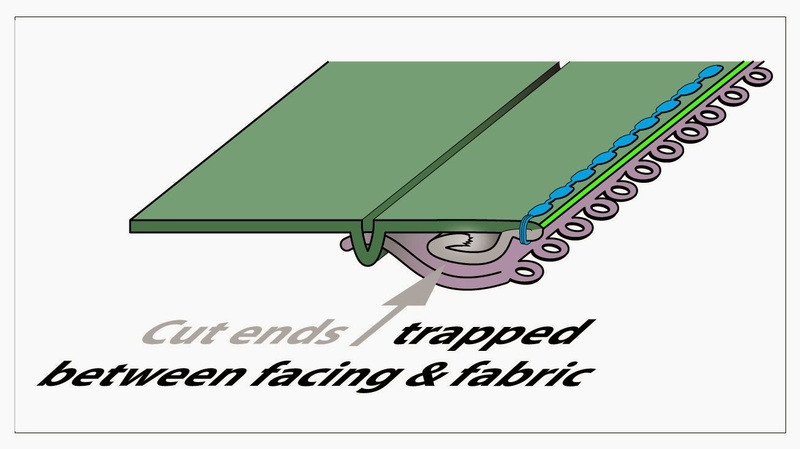 On this photo, as well as the schematic above, the folded edge is colorized bright green and the cut-edge fabric colorized gray. The natural curl of the cut-edge is reinforced by the waste-yarn fold. That fold pins the curl tightly against the underside of columns 8 and 9. In fact, this is one of the reasons the waste yarn is inserted in the first place--to control the location and tightness of the curl exhibited by the cut-edge. Here's one more look at the cut edge curling under--a schematic side-view showing the sandwich surrounding the curled-under cut-edge. The cut-edge is the stuffing, the facing is the bottom layer and the upper fabric (columns 8-9/15-16 on the chart) is the top layer. We're now at the grand finale stage. If you think about it, everything is done, except for sealing up the remaining long edge of the facing, thus forever trapping the cut edge inside the sandwich. This final seal is created using a crochet hook and a running yarn, creating a line of slip stitch right through the edge column, almost exactly the same way we did previously with the waste yarn. This time, however, we're not only going to stabilize the folded garment-edge, but also catch the live loops of the facing at the same time, thus binding them off. Of course, the edge is already stabilized with waste yarn. So, we have to remove the waste yarn, stitch by stitch, to make room for the permanent slip stitch along the same edge. 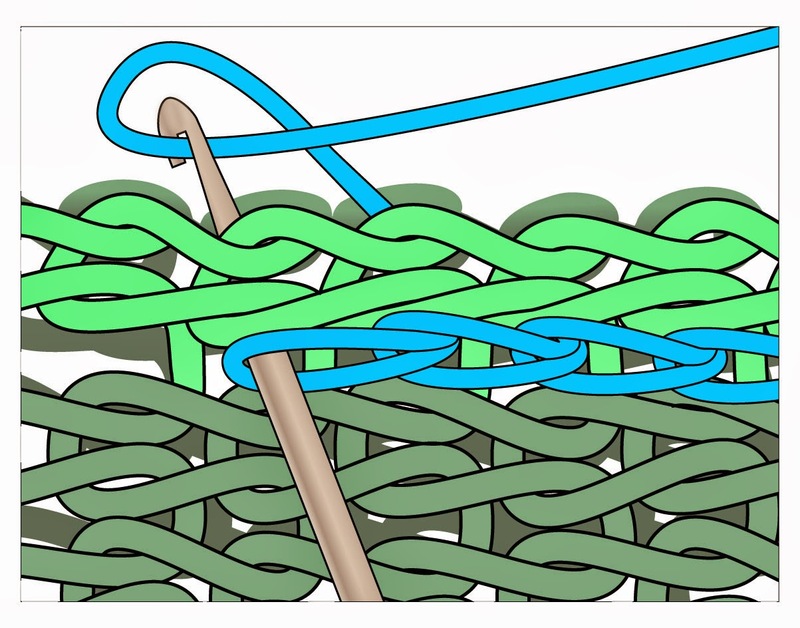 This is where the other purpose of the waste yarn appears: removing the waste yarn stitch-by-stitch serves as an exact guide for which column to follow in this grand finale step. As to how the work proceeds, if you look at the below schematic, you'll see the 3-in-1 trick in action. In both the schematic and the photo, the live loops of the facing are colorized red. As the crochet hook passes by the knitting needle holding the waiting live (red) facing-loops, the hook catches the next loop in line. It is then inserted upward through the folded edge column, there to catch the lavender running yarn. 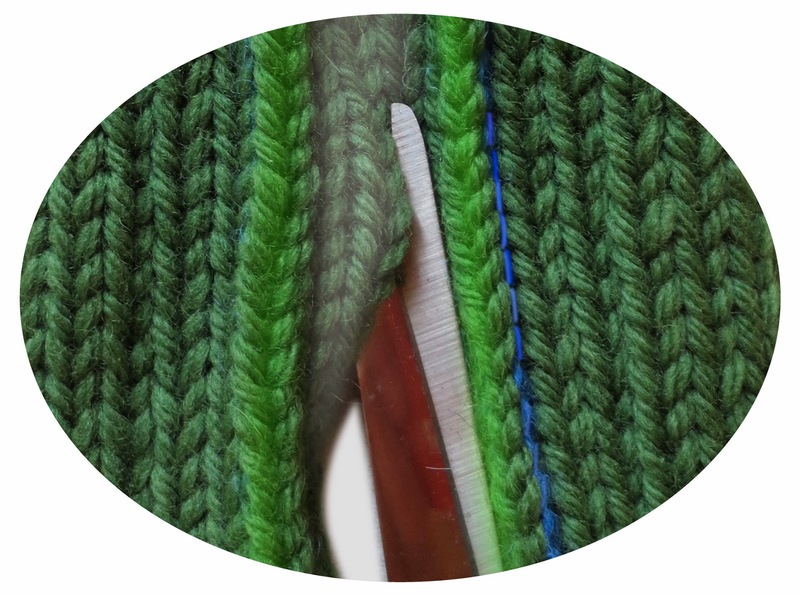 The photo shows a red loop already caught around the barrel of the hook and the hook already inserted through the edge, ready to draw down a new loop from the running yarn. When the running yarn is drawn down through both loops on the barrel of the crochet hook, the red loop simply disappears under the resulting slip-stitch at the edge. This attaches the facing to the edge, and binds off the facing at the same time, thus trapping the cut ends in between--a real 3-in-1 trick. 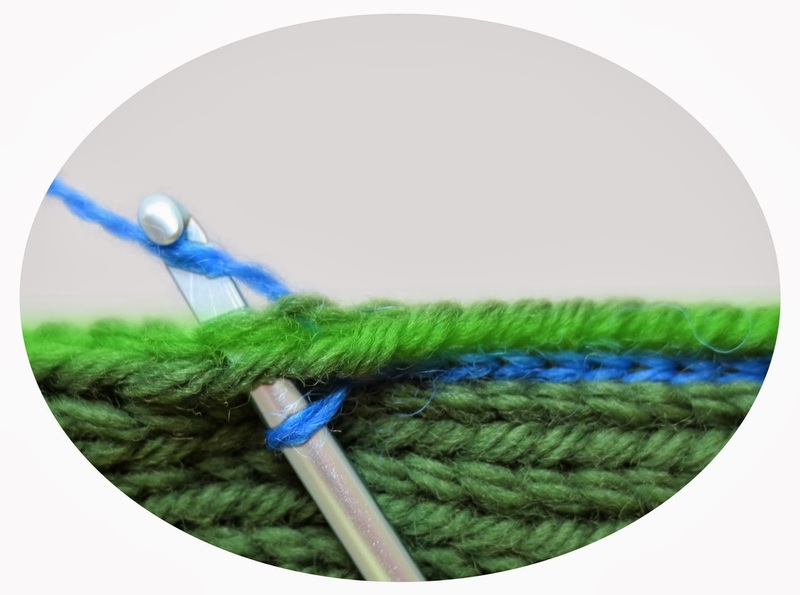 A single stitch is left around the barrel of the crochet hook, and the whole process begins again by catching the next red loop from the waiting line. Last but not least, here are photos of the finished result--a faced steek, with the cut edges forever tucked out of harm's way. The front. If you enlarge, you can see the "stitched" appearance of the lavender yarn along the garment edge. However, the purl anchor-column remains hidden, almost invisible. In real life, you might make a facing a different color than the sweater: a scarlet facing on a plain gray sweater would be a fantastic design element, for example. However, it would probably be more common to use a thinner yarn in the same color. The lavender-on-green theme of this post was more for demonstration purposes. Whew. Such a long post. Buttonholes, zippers, sleeve openings, color knitting and other real world adaptations of this basic steek must await further postings. Until then, good knitting! Addendum, 2016. Not so beta anymore. 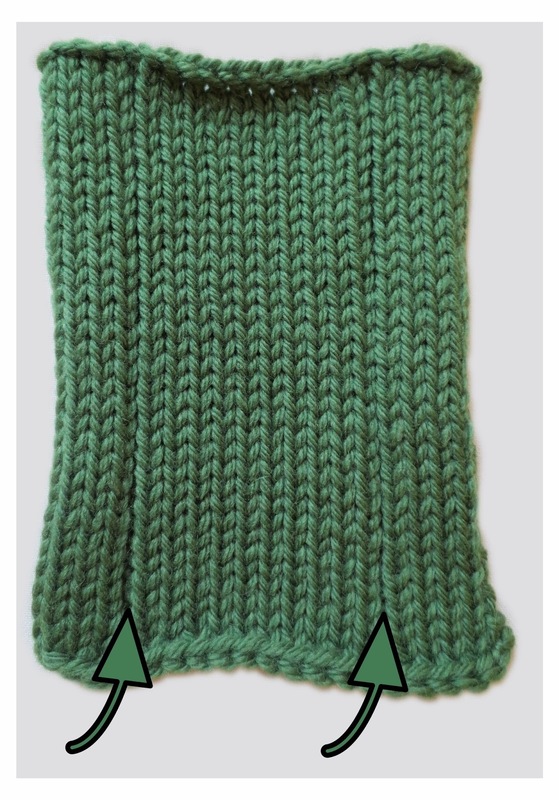 Here is a link to a Ravelry page where this trick was used with modifications to (beautifully!) install a zipper on a Henley-neck. * IMHO, of the three common brand names of wool listed, the Patton's Classic Wool is the grabbiest, the Ella Rae Classic the least grabby and the Cascade 220--the green mc yarn used for the sample swatch--of intermediate grabbiness. The cc I used, the lavender sports weight wool of unknown origin, was both grabby and splitty (sports weight = a weight of yarn, thinner than DK weight, which is normally knit up at 6 or 6.5 st/inch). 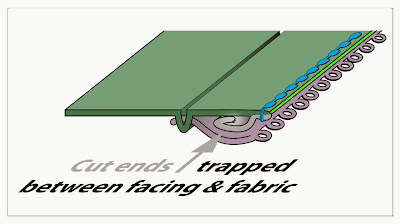 ** Separating the fabric edge from the garment edge--as we are doing here--is a long-time theme here at TECHknitting blog. This series explains further (link goes to part 1). You have been reading TECHknitting blog about steeks.